Paid Dues is Coming, are you Ready?! 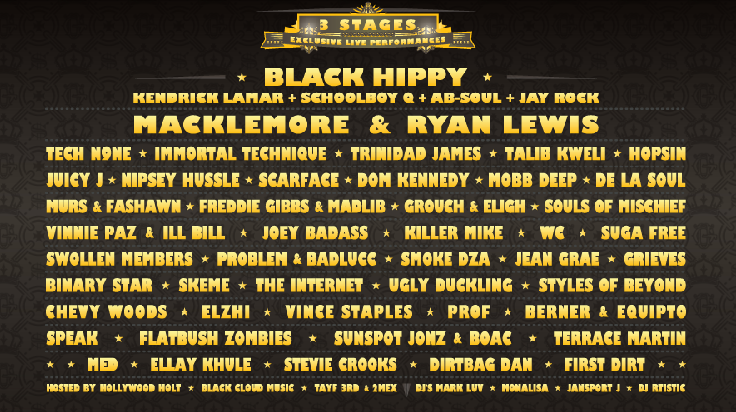 Hip Hop Heads, the 8th annual Paid Dues Festival is a mere two weeks away, do you have your tickets? If you don’t you better get on it, because this year promoters Murs 3:16 and Guerrilla Union have put down on paper one of the most eclectic hip hop festival lineups that you will ever see, regardless of the year, place, or time. It’s going down on March 30th at the San Manuel Amphitheater in San Bernadino. The line-up and schedule are already up. In all there are forty acts participating in the fest including heavy hitters like Macklemore, Talib Kweli, Trinidad James, De La Soul, and Tech N9ne. We here at SUPERGOODMUSIC are pretty stoked about sets from Hopsin, Grouch & Eligh, Swollen Members, Killer Mike, Black Hippy, and of course, our favorite rapper and trippy aficionado Mr. Juicy J!